I think it turned out okay, but the two polishes I used for the base coat were miserable to work with. I’m thinking about de-stashing them. While it’s nice that they dry matte, they also take forever to dry and do not self-level at all. I had to start over several times because even after they dried enough to not be sticky, they dented at the slightest pressure. Probably the only reasons I have for keeping them is because then I have the “set” of Demi Mattes and also because I like how Blackboard is a lighter shade of black than the usual. It allowed me a little extra leeway to stamp on top of it with a darker black. I really should do more matte finishes. They’re rather unforgiving but can look so sophisticated. (Probably because they are less forgiving. Hah!) Still. Polishes that come with a matte finish really don’t impress me. 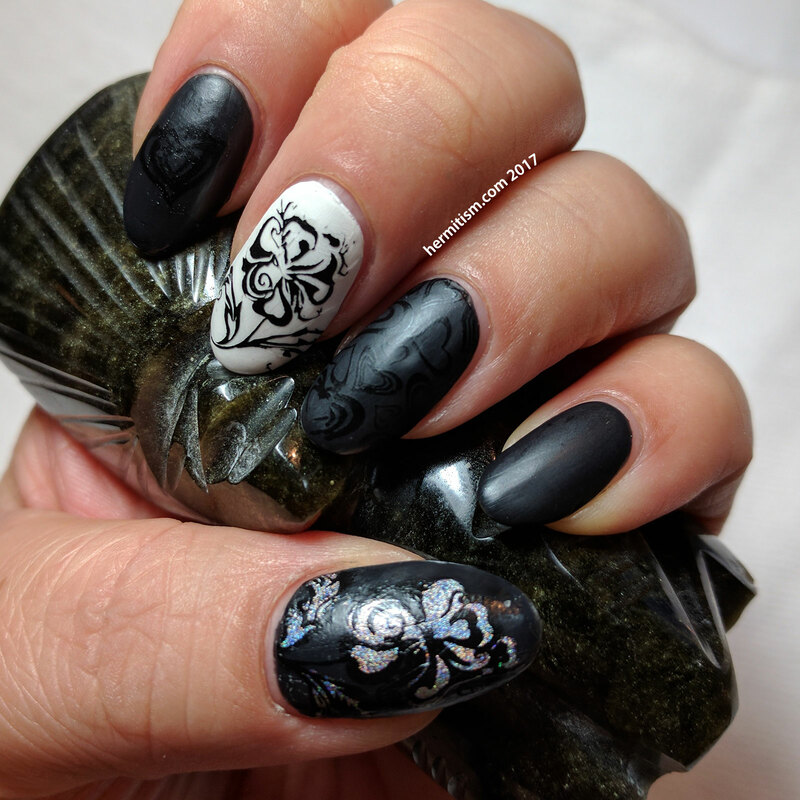 They usually have more trouble with self-leveling and either dry really fast (increasing your chances of playing with the polish too much and creating ridges) or take foreeeever to dry. I can’t sit still long enough for nails to dry most of the time. Unless I use a fast drying top coat like Seche Vite my nail art will be destroyed before I can photograph it. But then the Seche Vite makes them shiny so the matte finish is negated. I will always have to use a matte topcoat to get the effect. I don’t mind though. The best part about matte topcoats is that they dry to different kinds of matte. There are some that dry to an absolute matte and some that have a more satiny finish. Just by buying these bottles you effectively increase the range of your polish collection by every single bottle that didn’t have that finish. Who could fail to be excited by that thought? This is a really cool way to stamp! I love the subtly of the different blacks together. Thank you. I was inspired by the rain drop nail art I have seen other people do. 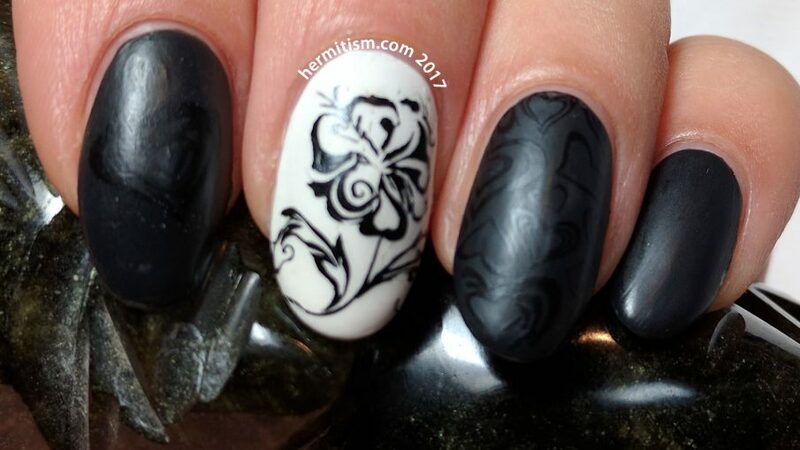 I love the subtle stamping!